In case you missed it, here are my first impressions of the newest Pokemon generation. One of the biggest additions to Pokemon X/Y is super training. EV training, for those who don’t know, is a way to train your Pokemon to get even higher stats. Each Pokemon defeated gives you Effort Values (EVs). Each Pokemon can gain a maximum of 510 EVs, while each stat can have a max of 255. Every four EVs increases a Pokemon’s stat by 1. There are some other factors (vitamins, power items, PokeRus, etc.) but that’s the gist of it — you can increase your Pokemon’s inherent stats by EV training. Up until this generation, EV training meant taking the stat you wanted to train (for example, special attack), finding a Pokemon that gives good special attack EVs for defeating it, and grind until you maxed out. Super Training allows you to EV train more interactively by playing mini games with your Pokemon. Stat gains are shown on a chart spreading in the six directions of the six stats. Your Pokemon also earn and find punching bags that will increase these stats even quicker. I haven’t gotten to the point of EV trainig yet, so I’m not sure if this is faster than the old method. EXP Share definitely seems too easy. As I mentioned in my other article, EXP Share is now turned on/off for the whole party, rather than a single Pokemon. Turning it on allows you to use a single Pokemon strong to the area you’re in while still keeping your entire party leveled up. I felt overpowered until I turned it back off. I was also learning multiple moves between uses of different Pokemon — my Frogadier evolved into Greninja and learned two moves before I even used him. The old “start and switch out” method for leveling up low-level Pokemon is still the way to go for me. I have more “wow, what a cool detail” things to talk about, so here comes another list! Pokeballs scale to the size of the Pokemon you are catching. A Pokeball thrown at a Weedle is much smaller than one thrown at an Onix. TMs/HMs are much friendlier to use. Rather than having to fire one up and go to a separate screen to see who can use it, it’s all displayed at once for you. Friendly tip — if you choose a Pokemon, choose Give Item, then go to TMs/HMs, it will only show the ones that Pokemon can use. The camera is very active, whether it’s rotating with you around corners or zooming in while you’re in a dark cave to add tension. Hordes are frustrating if you don’t have a move to hit them all at once. Watching as four Pokemon use tail whip, then three use Work Up, then your Pokemon is both poisoned and wrapped, get’s old quick. On the horde note, my roommate found a horde of four Zigzagoon and a Seviper. The Zigzagoon killed the Seviper before he could catch it. When a Repel wears off, the game asks you if you want to use another. I can’t remember if that was in the last generation or not, but man is it a nice feature. Weather effects are shown on both screens. For example, the “camera” that shows the bottom screen has some water drops during a rain storm. Mega Evolution is pretty badass looking. You have to get an item for your trainer before your Pokemon can do it, but I’ve already got my Gen 1 starter mega stone plus two more (Ampharos, Gengar). 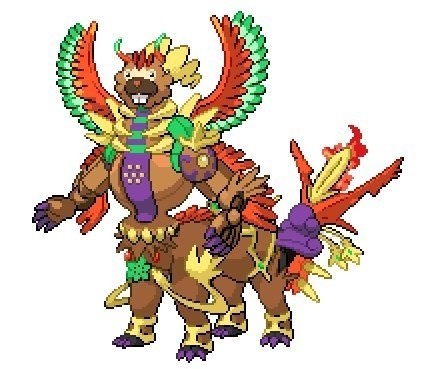 It’s a shame this Mega Bidoof is fake. Or is it? If you’ve ever enjoyed Pokemon, you really should pick up X/Y. This generation of games is truly a leap forward rather than just another sequel with a few more bells and whistles. The Pokedex and map are absolutely huge. A used 3DS or even a 2DS can be found relatively cheaply. If you haven’t already started, what are you waiting for?